Rufino Tamayo (1899–1991), one of the most celebrated artists of the 20th century, was drawn to New York City at a time when unparalleled transatlantic and hemispheric cross-cultural exchange was taking place. “Tamayo: The New York Years” is the first exhibition to explore the influences between this major Mexican modernist and the American art world. It reveals how a Mexican artist forged a new path in the modern art of the Americas and contributed to New York’s dynamic cultural scene as the city was becoming a center of postwar art. 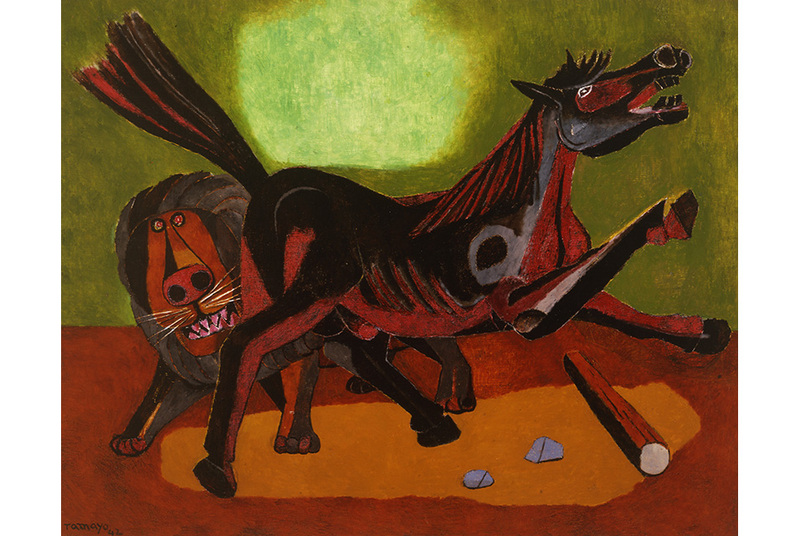 Rufino Tamayo, Lion and Horse [León y caballo], 1942, oil on canvas, 36 1/4 x 46 1/2 in. Mildred Lane Kemper Art Museum, Washington University in St. Louis, University purchase, Kende Sale Fund, 1946 © Tamayo Heirs/Mexico/Licensed by VAGA, New York, NY. “Tamayo: The New York Years” brings together 41 of Tamayo’s finest artworks, including a number of key loans from public and private collections in Mexico, that place Tamayo at the center of a major shift in the history of 20th-century art. The exhibition offers a unique opportunity to trace Tamayo’s artistic development—from his urban-themed paintings depicting the modern sights of the city to the dream-like canvases that show an artist eager to propel Mexican art in new directions. E. Carmen Ramos, the museum’s deputy chief curator and curator of Latino art, organized the exhibition, which is on view at the museum’s main building from Nov. 3 through March 18, 2018. “Tamayo: The New York Years” is the latest in a series of projects at the museum that situates the art of the United States in a global context. Tamayo lived in New York intermittently from the late 1920s to 1949. During this period, he befriended and exhibited with Reginald Marsh, Stuart Davis, Yasuo Kuniyoshi, Berenice Abbott and other New York-based artists who wanted to capture modern urban life. Tamayo, who had been interested in popular entertainment in Mexico, found in Coney Island a unique locus of modernity and the American experience. He depicted Coney Island several times, including in “Carnival” (1936), which was recently acquired by the museum. Tamayo’s exposure to international modernism in New York, coupled with his firsthand study of pre-Columbian and Mexican folk art, led him to his own synthesis of modernist styles and Mexican culture. Tamayo also crossed paths with younger American artists including Jackson Pollock and Adolph Gottlieb who, like him, would break ground with new modes of representation befitting the seismic social transformations of the midcentury period. This exhibition considers how New York—its sights, artists, critics, collectors and art venues—nurtured Tamayo’s vision of modern Mexican art. In this context, he created an art that resisted clear narratives, emphasized the creative rather than political underpinnings of art making and mined the ancient myths and forms of indigenous art to express the existential crisis of World War II. In 1939, Tamayo saw Pablo Picasso’s “Guernica” (1937) at the Valentine Gallery and the influential artist’s retrospective at the Museum of Modern Art. Inspired by Picasso’s imagery and reliance on African art, Tamayo reconsidered the forms and myths of Mexico’s pre-Hispanic and folk art as the basis for a series of wartime paintings featuring aggressive and deprived animals. By the 1940s, his richly colored and abstracted compositions modeled an alternative “American” modernism that challenged social realism and dovetailed with a rising generation of abstract expressionists who were also seeking a visual language that fit their uncertain times.